Eventful history has endowed Bulgaria with a rich cultural, architectural, and artistic heritage, while natural beauty and recreational opportunities make it one of Europe's most desirable holiday destinations. Carpeted by dense forests and fed by mighty rivers, this ancient land once drew invaders from distant corners of Europe. Today the country's Black Sea coastline and seven rugged mountain ranges top the itineraries of nearly 8 million annual visitors. While the country's growing cities offer modern shopping, dining, and entertainment opportunities, Bulgaria's countryside remains a history buff's paradise, boasting well-preserved reminders of ancient civilizations that conquered or passed through the land. Begin your Bulgaria holiday in Sofia, one of Europe's oldest capitals, with over 250 historic landmarks. Northwest Bulgaria: The northwest region serves as a gateway to the nation's capital, Sofia, and acts as a veritable playground for avid rock climbers and outdoor enthusiasts with its interesting rock formations and hiking trails, many of which end at waterfalls. Southwest Bulgaria: This region is known for its large collection of mountain resorts, the forests and lakes of Pirin National Park, and UNESCO World Heritage Site Rila Monastery. Northern Thrace: The northern part of the country is popular on Bulgaria itineraries for its ancient structures like The Valley of the Thracian Kings and Stara Zagora, one of the oldest continuously populated places in Europe. Bulgarian Black Sea Coast: The region stretching along the Black Sea coast teems with sandy beaches, water sports centers, and diving centers that are so often sought after on a summer vacation. Central Northern Bulgaria: In addition to castles, wild forest, and winding great rivers, the central northern region boasts modern 20th-century cities with grand architecture. Sofia: The capital of Bulgaria offers numerous attractions including museums, monuments, ruins, and shopping centers surrounded by Roman and Byzantine architecture. Sunny Beach: Sunny Beach serves as the hot spot for nightlife and is the most popular Bulgaria vacation destination in the country; visitors return annually for its beautiful beaches, booming nightclubs, and thrilling theme parks. Varna: This coastal city combines history and maritime activities, featuring sites like Bulgaria's largest Roman baths, water sports, beaches, and a charming cafe scene. Bansko: This ski resort is one of the top Bulgaria places to visit and boasts the longest ski runs in the country, with world-class slopes and scenery for skiing and snowboarding. Plovdiv: This university town houses delightful cobblestone streets, atmospheric cafes, and ancient historical sites, including a Roman amphitheater that is nearly intact. Borovets: Once used as hunting grounds for national royalty, this ski resort is the oldest of its kind in the country and provides slopes for snowboarding, cross-country skiing, ski jumps, night skiing, and more. Veliko Tarnovo: Dubbed the historical capital of the Second Bulgarian Empire, this city is popular for its unique architecture and historical ruins as well as sites along the Yantra River. Sozopol: This charming, romantic city is popular for beach getaways, with a touch of history around the cobblestone streets, fortress walls, and its Old Town. Balchik: This fishing town offers sandy beaches, water sports, and nature walks around a 20th-century palace famous for its flower gardens. Nessebar: Listed as a World Heritage Site, this city dates back to ancient times and still houses numerous ruins and structures today, including 19th-century wooden homes and Thracian archeological sites. Burgas: Due to its location surrounded by water and a temperate climate, this city is a popular Bulgaria tourist destination and features museums, historical sites, beaches, and lakes perfect for swimming and bird-watching. Nessebar: Do not miss this seaside resort area on the Black Sea coast that boasts fine sand beaches and traces of Thracian, ancient Greek, Roman, and Ottoman civilizations that make this attraction a World Heritage Site. Nessebar: This ancient town is prized for its fortress wall ruins from Roman times and the Middle Ages as well as old Byzantine and Bulgarian churches and houses. Cathedral Saint Alexandar Nevski: This huge Orthodox cathedral, the second largest in the Balkans, is topped with golden new-Byzantine domes and displays an extensive collection of icons including St. Alexander Nevski's rib. 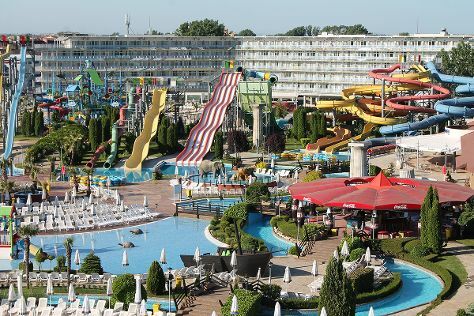 Action Aquapark: Cool off while Bulgaria sightseeing at this water park offering dozens of thrills like slides, pools, an adventure island, and even a mini zoo. Ski Bansko: Test yourself on Bulgaria's longest ski runs at this well-known resort, where the facility offers challenges for every skill level by offering a bunny slope, Rollbahn ski run, and a giant slalom run. Borovets Ski Resort: Another well-reviewed ski resort, this Bulgaria tourist attraction puts on exciting ski jumping shows performed by the instructors and allows visitors to ski and snowboard in the former hunting grounds of Bulgarian kings. Rila Monastery: Dating back to the 10th century, this World Heritage Site is the oldest religious center in the Slavic world and features frescoes, a gold-plated iconostasis, and a museum displaying Rafail's Cross, which depicts 104 religious scenes and includes 650 miniature figures. Boyana Church: Visit the site that made the World Heritage list for its well-preserved collections of Eastern European medieval art including 18 frescoes depicting the life of St. Nicholas. Tsarevets Fortress: More than just a fortress, this site actually houses a medieval town with the remains of more than 400 houses, four monasteries, craftspeople's workshops, gates, towers, and the foundations of the royal palace. Palace and Botanical Gardens of Balchik: Explore the beautiful scenery at this palace built for Queen Marie in 1926, where a tour will include a wine cellar, smoking hall, monastery, holy spring, and a large collection of cactus species in the gardens. Bulgaria is a great destination to travel with children because it hosts a variety of both winter and summer activities along with sprawling cities to keep the family entertained. Sofia, the capital, could keep families busy for days with its collection of fascinating museums, shopping centers, entertainment venues, and parks. For a quieter scene, head to Sunny Beach, which features everything from sandy shores to historical monuments amidst a romantic town. Ski resorts in the Bulgarian mountains are popular with all ages and skill levels. All resorts offer introductory classes to skiing and snowboarding, and some provide additional activities like sledding, cross-country skiing, and night skiing, making them good Bulgaria tourist attractions for families. You cannot truly experience Bulgaria without a look into its ancient history. Head to Veliko Tarnovo to explore ancient ruins that will have the kids' imaginations racing. Kid-friendly activities are pretty easy to find in this diverse country. Summertime Bulgaria vacations call for visits to the thrilling water parks, including Action Aquapark, which features slides, pools, and an adventure island. Or, cool off along the coast, where sandy beaches and shallow waters make for great swimming and sunbathing. For an active vacation, visit family-friendly resorts like Ski Bansko and Borovets Ski Resort (the latter even puts on ski jumping shows performed by the instructors). Animal-lovers will enjoy Zoo Sofia. Over 4,500 animals representing 850 species call this park home, and kids can see brown bears, monkeys, white rhinos, hippos, lions, and much more. The ''Primorski'' park houses an aquarium, zoo, dolphinarium, and planetarium. Quite a few hotels in Nessebar offer shows and live performances including juggling, music, and magic shows you can pay to attend. Try to book all of your plans and hotel reservations early, as early bookings are often rewarded with discounts (and often you'll find even bigger discounts for children). Expect to eat lots of bread and dairy products during your Bulgaria holiday, as they are staples in the Bulgarian diet. Meals also often include sausage, or some other type of meat, and vegetables. Vegetarians may have a hard time finding an appropriate dish. Do not miss the chance to try banitsa, a pastry filled with cheese, eggs, pumpkin, rice, or leeks. The pastry is commonly eaten for breakfast accompanied by boba, a grain-based drink, or yogurt. There is plenty of shopping available in Bulgaria, ranging from high-fashion stores to small village toy shops. Large shopping malls and department stores are easy to find in most cities, but consider shopping the small boutiques located on pedestrian streets, which offer a more cultural and personal experience. Some national specialities include red wine by Damianitza, wooden carvings, rakia, and painted earthenware. No matter what kind of shopping experience you choose, you can expect reasonable prices for items in Bulgaria. Thracians first settled the area in ancient times and built grand monuments and structures that have lasted until today. Do not miss these fascinating Bulgaria places to visit, which include wonders like The Valley of the Thracian Kings that is estimated to contain over 1,500 burial mounds. The Thracian people disappeared when Slavs settled in the land in the 5th century. Christianity unified the people in 864 CE, and a united language and writing system followed. By the 10th century, Bulgaria was considered one of the most powerful empires in Europe, but the rule only lasted until the 14th century when the Ottoman Empire took over and ruled for 500 years. You'll find traces of this rule at Nessebar. Under Ottoman rule, Bulgarian schools and cultural centers were formed, and the Bulgarian church regained independence for the Greeks. Bulgaria began uprising against the Empire in the 19th century, and after Russia defeated the Ottomans in 1878, Bulgaria was reestablished as a state. Bulgaria joined World War II in 1941 as a member of the Axis but chose to save its Jewish population from deportation to concentration camps. When Bulgaria did not comply with Soviet demands to remove German forces from its territory, the USSR invaded in 1944 and took over Bulgaria. Leaders of the USSR ended ties with Germany and joined the Allied side until the war ended. Following World War II, communists took power and aligned the country with the Soviet Union and other Warsaw Pact members. The ensuing decades were marked by economic hardship and repression of political dissent. In 1990, the Communist Party finally acceded to demands for free elections. The party actually won the elections, albeit after having removed its more hardline members. Throughout the rest of the decade, Bulgaria went through a difficult transition to a free market as corruption and organized crime became endemic. The new millennium has brought greater stability and economic growth, with Bulgaria becoming a member of NATO in 2004 and the European Union in 2007. The most commonly confusing Bulgarian custom is the expression of "yes" and "no." When Bulgarians shake their head side to side, they mean yes, and up and down means no. This may cause frustration, but don't worry because natives are famously friendly and hospitable. If invited to someone's home, take a gift of sweets or flowers. Even if you were not invited, you will be greeted and offered food and refreshments. If you take your Bulgaria vacation during winter, do not be surprised to find natives shopping and planning to exchange presents on January 1 instead of Christmas Day. In Bulgaria, Grandfather Frost brings gifts to kids all over the country; join in the fun and buy a present for any local friends you meet. New Year's is celebrated on the same day with feasts and lucky traditions. In summer, Saint George's Day is marked on May 6 to honor the patron saint of shepherds and the army. Also look for festivals of masked kukeri, marking the beginning of spring and the agricultural season. These festivals are especially important in the countryside and small villages. Take lightweight clothing when visiting in the summertime to help you tolerate the hot weather. Snow falls frequently from December to mid-March, making the country a great getaway for winter sports but a chilly environment for Bulgaria sightseeing. Always be prepared with rain gear, too, in case of occasional clouds. Transportation is well developed and extensive in this country, making it easy to visit all the popular Bulgaria places to see. Rail transport is dependable and comfortable, making it the ideal method (plus it is quite a bit cheaper than air travel). If you do prefer to fly, the country has four international airports in addition to local airports. If you're travelling to smaller villages and the countryside, take a bus available via several routes. Buses also travel internationally to other European cities. The official language is Bulgarian, although visitors who are familiar with Russian, Greek, or Turkish will notice similar vocabulary and grammar in Bulgarian. English is becoming more common nowadays, and much of the younger generation is at least somewhat familiar with English. Tipping is a common practice in Bulgaria; expect to tip 10 percent in restaurants if the service charge is not already included in the bill. Keep in mind the wait staff is paid minimum wage and makes most of their money from tips. The same percentage of 10 percent is a common tip for taxi drivers for large fares, smaller amounts are given for short rides. Bartenders also generally receive small tips.